Adam Pollard aka Multiplier, presents a helpful video tutorial series about ways to get unstuck when feeling stagnated or lost when producing your music. Get a ton of helpful ideas that will get you back on track in no time! Adam welcomes you then starts with inspiring ideas on how to extend a melody, develop a chord progression, treat your arrangement as a workspace, and using subtraction techniques to add more to your tracks. Moving on you’ll learn production techniques such as “Doing the Opposite” to come up with interesting new elements, changing colors to spark different emotions and creativity, bouncing to audio to get you unstuck, and how to focus on songwriting instead of getting distracted by sound design or mixing details. Wrapping it up Adam gives more great ideas such as ways to beneficially reduce choice for a more focused approach, ways to create variations of drop leads, including workflow and organization tips like color coding and shortcuts, ways to help reset your ears if you’ve worked on your track for too long, ideas for searching for the perfect samples to use in your songs, and what to do if you just aren’t feeling creative. See the individual tutorial descriptions for more info. 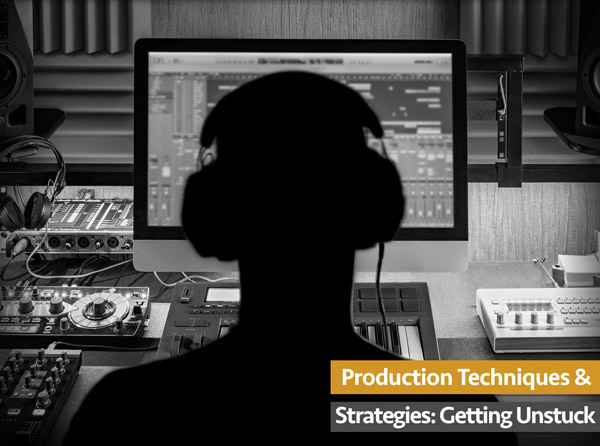 If you’re the creative type and or produce music, this video tutorial series will help you overcome the age old problem of getting stuck creatively… Watch “Production Techniques & Strategies: Getting Unstuck” today.